The second peace conference to promote ‘loyalty, freedom, respect and equality’ was held by the Ahmadiyya Muslim community in Tooting. Rosena Allin-Khan, Tooting MP, and Mayor of Wandsworth Richard Field, joined the president of the Hindu Society of Tooting Sunita Rai, president Khalsa Centre of the Sikh Community, Harbans Singh Mehta, and Tooting Police Inspector Barrie Capper, as well as faith leaders and Wandsworth Councillors. Ahmadiyya Muslim Tooting President Shakeel Ahmed opened the day before Imam Ata Ul Mujeeb Rashid of London Mosque spoke to attendees about Islam. The Ahmadiyya community presented appreciated certificates to some of the attendees in recognition of their support to the community. 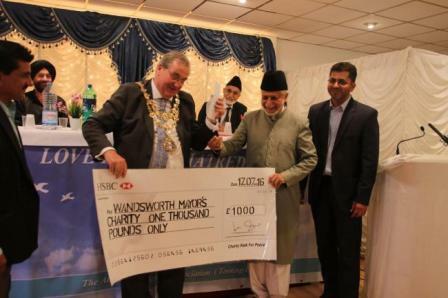 Dr Allin-Khan spoke about community togetherness and Mayor Field was presented with a cheque for £1,000 for the mayor’s charities. Share the post "‘Pathway to Peace’ promoted in second Ahmadiyya Muslim peace conference"